IQ Cath Safe and simple Male catheterisation. What is Intermittent Self Catheterisation and how will I ever manage? Problems with urethral strictures or false pockets? ... the Intermittent Self Catheterisation (ISC) catheter with many "intelligent" advantages. There are many different versions of iQCath available now on prescription. Hydrophilic, Gel and kit versions. Look on the iQ availability button on the main page to see what they are, the codes and images. Comments from users of the IQCath System. "If I wasn't actually passing the catheter myself, I wouldn't believe I was being catheterised." "Soft squeezable tip with a very bendy end, you don't have to be a Doctor to see its gotta be kinder on the plumbing." "Nothing goes in as easy." "I've had to use a Tiemann tipped cathter for years, but IQCath just glides in without any problems." Nothing New in ISC catheter design these days, its all about coatings and packaging...... Isn't it? Extremely bendable from tip to just after catheter eyelets. 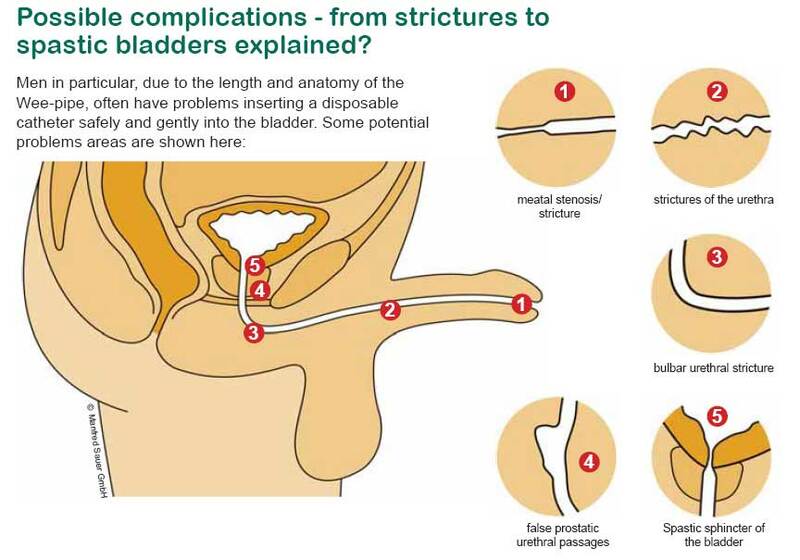 The result is an flexible end of catheter to navigate the bends of the male urethra. The main body of the catheter is much less flexible to allow for ease of handling. Eyelets rounded and polished inside and out and then coated. The coating is hydrophilic and can be activated by water or saline. The catheter has a high osmolality which means it will glide in and out without any dragging caused by the Catheter's coating interacting with your body's mucosa membranes. Catheters outlet spout will attach to any conical inlet connector on a standard leg or night bag. IQCath's features mean it is easy to handle - the soft spherical tip and extra bendy end means it can easily navigate the bends in the male urethra round the prostrate and even past false pockets or false tracts and through urethral strictures! Many of our customers tell us about the problems they have had passing catheters because of 'spastic sphincters' , strictures and false tracts/pockets some people having to use special Tiemann tipped catheters to get past the strictures. These people tell us IQCath has no such problems, which is a good argument to use IQCath from the beginning as it may even prevent these strictures developing in the first place!